Ben Sage - Moving Woodstock: Great opportunity for a first time buyer or upgrading! 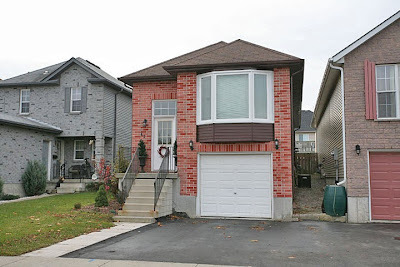 - MLS 63-437 - 41 Canrobert St, - Move in Ready, only $189,900. Great opportunity for a first time buyer or upgrading! - MLS 63-437 - 41 Canrobert St, - Move in Ready, only $189,900. *hint* - click the underlined words for more detail! This is a great 15 year old raised ranch located in a well established family friendly neighbourhood. It is located very close to parks and has quick and easy access to the major highways. What more could you ask for? This sturdy, fully finished and move in ready home features a concrete foundation, 3 bedrooms (Master, 3rd Bedroom/Office, Nursery). and a full bathroom on the main floor, as well as main floor laundry, a spacious eat-in kitchen, and separate dining room. Plus a comfortable living room! In the newly finished basement level you will find inside entry to your single car garage (a rarity in this neighbourhood! ), extra storage in the utility room and under the staircase, a spacious full bathroom, rec room, family room, and a bonus room. Enjoy year round convenience and efficiency thanks to the high efficiency forced air gas furnace with central air conditioning, and no-maintenance exterior of brick and vinyl siding. Let’s not forget the nice two-tierd deck in your fully fenced back yard. This extremely well decorated home has plenty of space for your growing family, and is ready for quick possession! All appliances included. Be sure to check out the Virtual tour!